Just like Icelandic chickens and horses, Icelandic sheep are known for being hardy, resilient and untainted by other breeds for thousands of years. They are a tri-purpose breed, meaning they are valued for their meat, milk and wool. They are also the only kind of sheep in the world to have a sub-breed, called leader sheep. We are proud to have started an Icelandic sheep flock at Heritage Haus, and have selected stock for their meaty builds and quality fleece. Their lambs will produce mild but flavorful meat in addition to wool and pelts. We are excited to be able to offer these new products on our farm! We are members of ISBONA, and CLRC, the official registry association for Icelandic Sheep in North America. Icelandic lambs reach slaughter weight in 4-5 months. They generally do not require grain if fed quality hay and pasture. Their meat is fine grained, mild in flavor and has excellent texture. We will be offering Icelandic lamb next fall. Icelandic Sheep have a double layered coat. The inner layer, or thel, is insulating, superlight and very airy, while the outer layer, or tog, is long, strong and water repellent. Carded together, these two layers make lopi, versatile wool used to knit lopapeysa, the distinctive traditional Icelandic sweater of concentric rings. We are just learning all about the intricacies of wool, but hope to offer quality wool (and pelts) from our sheep in the future. Birthing Record: 2,2,2,2. Moorit Ewe with great, stocky build and good parasite resistance. Birthing Record: 1, 1. Nice white ewe with gorgeous fleece and the best horns in the flock. Very nice udder, easy to hand milk. Birthing Record: 2,2,2,2,2 Large black grey ewe. Carries moorit from her dam. Prolific with strong mothering instincts & great milk. Birthing Record, 2,2 Solidly built black grey ewe. From a prolific line with lots of nice fleece and a good disposition. AI genetics incl. Bambi, Raftur, Grani, Kani & Flotti. Birthing Record: 1,1,2. White Ewe with muscular build and great mothering instincts. Carries spotting. ”Dot” had a bit of a rough start, but is coming along now! Her fleece is very soft and fine. We are looking forward to watching her continue to mature. Horned Spotted Moorit Ewe Lamb. A huge lamb and a triplet! We can’t wait to see her offspring next year! Black-gray badger ram lamb. We are very excited to bring an AI Kornelius son to our farm! A nicely-growing boy with excellent fleece and a meaty build. He may carry moorit and/or spotting. 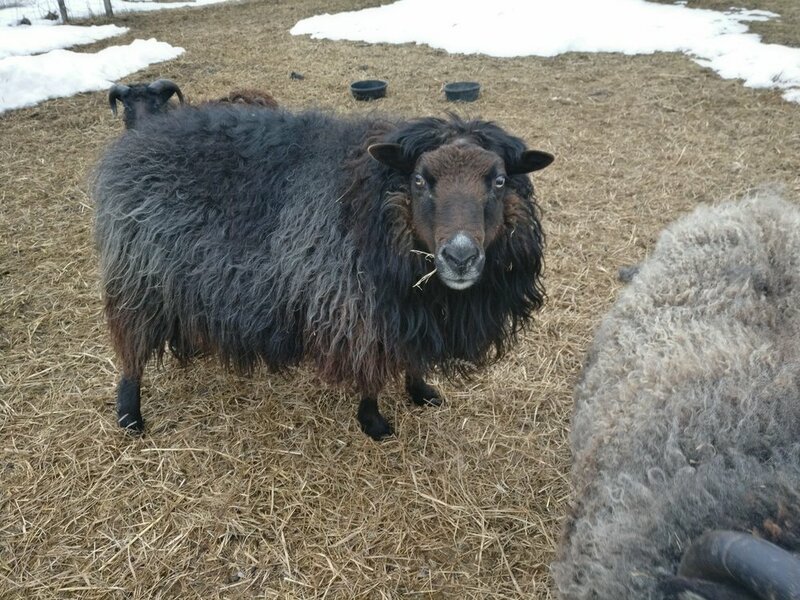 Black yearling ram, nice soft fleece, and solid build. Icelandic sheep are aggressive foragers that graze longer and forage widely, utilizing all of the available pasture. They do not generally lose body condition even during the hot humid temperatures of summer. We value resourceful, resilient animals so this is a big plus for us. Icelandics are seasonal breeders, coming into season in the fall, with lambs arriving in mid-late spring. This means that rams and ewes can run together in other times of the year. Icelandic are a tri-purpose breed, producing excellent meat, quality wool and milk.